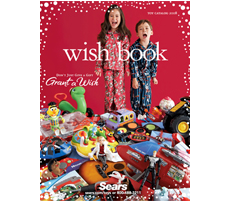 You can get a free copy of the Sears Wish Book and other Sears catalogues. You should be able to order the US Sears Wish Book in October. Delivery of the catalogues will take 2 -3 weeks. Canadians: Call 1-800-267-3277 or order online to request a catalogue.